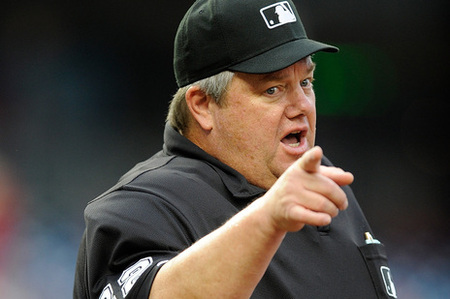 Play by the Rules, or else we’ll have Joe West run you out of the game quicker than a skulled flop shot. The official USGA Rules of Golf sets forth the actual Rules, defined terms, and decisions of the game of golf. Golf is such a wonderful game, so the Rules ought to be straightforward and easy to understand, right? Tee the ball up between the tee markers, play as it lies until it’s in the hole, one stroke and a drop if you’re in a water hazard, a stroke plus distance for hitting it out-of-bounds, and no funny business along the way. There, we’ve reduced the Rules of golf down to five or six simple concepts. So we don’t need a book, right? Wrong. Anyone who has ever picked up a copy of Rules of Golf knows otherwise. The Rules themselves, all 34 of them, are actually fairly straightforward and logical. However, the official defined terms and published decisions on the Rules are blindingly deliberate and make the sections on international taxation of the Internal Revenue Code look like bedtime stories. I’m Mr. Rules, and these are the Rules because I say they’re the Rules, so get over it! Periodically, we’ll review the official USGA Rules of Golf, poke fun at some of the defined terms, and discuss the frustrating hilarity of some of the official Decisions handed down by the USGA concerning the Rules of Golf. An archive of my commentary is set forth below for your quick reference and convenience.